Now, as I said, the way to the Celestial City lies just through this town where this lusty fair is kept; and he that will go to the city, and yet not go through this town, must needs go out of the world. The Prince of princes himself, when here, went through this town to his own country, and that upon a fair day too Yea, and as I think, it was Beelzebub, the chief lord of this fair, that invited him to buy of his vanities; yea, would have made him lord of the fair, would he but have done him reverence as he went through the town. Yea, because he was such a person of honor, Beelzebub had him from street to street, and showed him all the kingdoms of the world in a little time, that he might, if possible, allure the Blessed One to cheapen and buy some of his vanities; but he had no mind to the merchandise, and therefore left the town, without laying out so much as one farthing upon these vanities. This fair, therefore, is an ancient thing, of long standing, and a very great fair. First: The pilgrims were clothed with such kind of raiment as was diverse from the raiment of any that traded in that fair. The people, therefore, of the fair, made a great gazing upon them: some said they were fools, some they were bedlams, and some they are outlandish men. Secondly: And as they wondered at their apparel, so they did likewise at their speech; for few could understand what they said; they naturally spoke the language of Canaan, but they that kept the fair were the men of this world; so that, from one end of the fair to the other, they seemed barbarians each to the other. 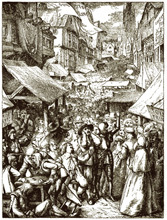 Thirdly: But that which did not a little amuse the merchandisers was, that these pilgrims set very light by all their wares; they cared not so much as to look upon them; and if they called upon them to buy, they would put their fingers in their ears, and cry, Turn away mine eyes from beholding vanity, and look upwards, signifying that their trade and traffic was in heaven. One chanced mockingly, beholding the carriage of the men, to say unto them, What will you buy? But they, looking gravely upon him, answered, “We buy the truth.” At that there was an occasion taken to despise the men the more; some mocking, some taunting, some speaking reproachfully, and some calling upon others to smite them. At last things came to a hubbub and great stir in the fair, insomuch that all order was confounded. Now was word presently brought to the great one of the fair, who quickly came down, and deputed some of his most trusted friends to take these men into examination, about whom the fair was almost overturned. So the men were brought to examination; and they that sat upon them, asked them whence they came, whither they went, and what they did there, in such an unusual garb? The men told them that they were pilgrims and strangers in the world, and that they were going to their own country, which was the heavenly Jerusalem, and that they had given no occasion to the men of the town, nor yet to the merchandisers, thus to abuse them, and to let them in their journey, except it was for that, when one asked them what they would buy, they said they would buy the truth. But they that were appointed to examine them did not believe them to be any other than bedlams and mad, or else such as came to put all things into a confusion in the fair. Therefore they took them and beat them, and besmeared them with dirt, and then put them into the cage, that they might be made a spectacle to all the men of the fair. And on Mount Calvary died. The town of Vanity is Bunyan’s depiction of the world around us—a world enamored with sin and enthralled by frivolity. It’s a world in denial of the authority of God—even the very existence of God. It is perilous to pilgrims. But passing through this town is unavoidable. We are all born in the City of Destruction and to journey to the Celestial City, “we must through many tribulations enter the kingdom of God” (Acts 14:22). 1. It is God’s will that we walk through this world, though it is fallen and marred with sin. God does not take us out of the world once He saves us. He keeps us in the world. We are to be “blameless and harmless, children of God without fault in the midst of a crooked and perverse generation, among whom you shine as lights in the world” (Philippians 2:15). If we are to share the hope we have in Christ with the people of this world, we must live and walk in their midst. I wrote to you in my epistle not to keep company with sexually immoral people. Yet I certainly did not mean with the sexually immoral people of this world, or with the covetous, or extortioners, or idolaters, since then you would need to go out of the world (1 Corinthians 5:9–10). We are called to be salt and light (Matthew 5:13–16), and in God’s design there may be times when we need to pass through dark and unsavory places. 2. Jesus Himself came to our broken world. “The Prince of princes himself, when here, went through this town to his own country.” Jesus came and “dwelt among us” that we might behold His glory (John 1:14). “He was in the world, and the world was made through Him, and the world did not know Him” (John 1:10). He was “tempted as we are, yet without sin” (Hebrews 4:15). Again, the devil took Him up on an exceedingly high mountain, and showed Him all the kingdoms of the world and their glory (Matthew 4:8). Then the devil, taking Him up on a high mountain, showed Him all the kingdoms of the world in a moment of time. And the devil said to Him, “All this authority I will give You, and their glory; for this has been delivered to me, and I give it to whomever I wish. Therefore, if You will worship before me, all will be Yours” (Luke 4:5–7). “These things I have spoken to you, that in Me you may have peace. In the world you will have tribulation; but be of good cheer, I have overcome the world” (John 16:33). 3. If we follow Christ and seek His Kingdom, our lives will be in sharp contrast to the world around us. Christian and Faithful stand out at the fair. They don’t fit in. They are not carried away and enthralled by the allurements of the fair that entice the citizens of the town. If then you were raised with Christ, seek those things which are above, where Christ is, sitting at the right hand of God. Set your mind on things above, not on things on the earth (Colossians 3:1–2). Therefore put to death your members which are on the earth: fornication, uncleanness, passion, evil desire, and covetousness, which is idolatry. Because of these things the wrath of God is coming upon the sons of disobedience, in which you yourselves once walked when you lived in them (Colossians 3:5–7). Beloved, I beg you as sojourners and pilgrims, abstain from fleshly lusts which war against the soul, having your conduct honorable among the Gentiles, that when they speak against you as evildoers, they may, by your good works which they observe, glorify God in the day of visitation (1 Peter 2:11–12). Do not love the world or the things in the world. If anyone loves the world, the love of the Father is not in him. For all that is in the world—the lust of the flesh, the lust of the eyes, and the pride of life—is not of the Father but is of the world (1 John 2:15–16). 2) The pilgrims speak differently. Their conversation is noticeably different from that of town’s people. They are not enticed by the latest gossip or lured with profane humor. They speak “the wisdom of God in a mystery, the hidden wisdom which God ordained before the ages for our glory” (1 Corinthians 2:6–8). They speak of spiritual things (the language of Canaan) and those at the fair cannot understand them. But the natural man does not receive the things of the Spirit of God, for they are foolishness to him; nor can he know them, because they are spiritually discerned (1 Corinthians 2:14). They are of the world. Therefore they speak as of the world, and the world hears them. We are of God. He who knows God hears us; he who is not of God does not hear us. By this we know the spirit of truth and the spirit of error (1 John 4:5–6). But now you yourselves are to put off all these: anger, wrath, malice, blasphemy, filthy language out of your mouth. Do not lie to one another, since you have put off the old man with his deeds (Colossians 3:8–9). 3) The pilgrims are not interested in what the town has to offer. They are not tempted by temporary and fleeting pleasures. They refuse to look at the wares displayed for sale. Also wisdom and instruction and understanding. This truly enrages the town and its merchants. Christians and Faithful are mocked and mistreated. When apprehended and interrogated they say that they are pilgrims and strangers in the world and are seeking a heavenly country. These all died in faith, not having received the promises, but having seen them afar off were assured of them, embraced them and confessed that they were strangers and pilgrims on the earth. For those who say such things declare plainly that they seek a homeland. And truly if they had called to mind that country from which they had come out, they would have had opportunity to return. But now they desire a better, that is, a heavenly country. Therefore God is not ashamed to be called their God, for He has prepared a city for them (Hebrews 11:13–16). Bunyan’s narrative of Christian and Faithful at Vanity Fair seems somewhat out of step with modern methods of evangelism. Why not set up a booth at the fair and beat the town at its own game? The church, especially in Western culture, is often more concerned about fitting in and appearing relevant to the world it is trying to reach, rather than standing out and standing for truth. Christian and Faithful are not afraid to stand for truth. Their bold testimony before the world sets them in stark contrast to the world. Yet, as we shall soon see, their testimony bears lasting fruit. Our greatest testimony before the world is when we live like Christians and exalt Christ and His Word above all else. But living for Christ can be costly. Christian and Faithful were beaten (persecuted), besmeared with dirt (made to look contemptable), and put in a cage (restricted and constrained). In the next post we will examine further the persecution Christian and Faithful were made to endure for the sake of the gospel.